Reposted July 2, 2012 as this is applicable to an upcoming post on user experience and influence – watch for it this week! 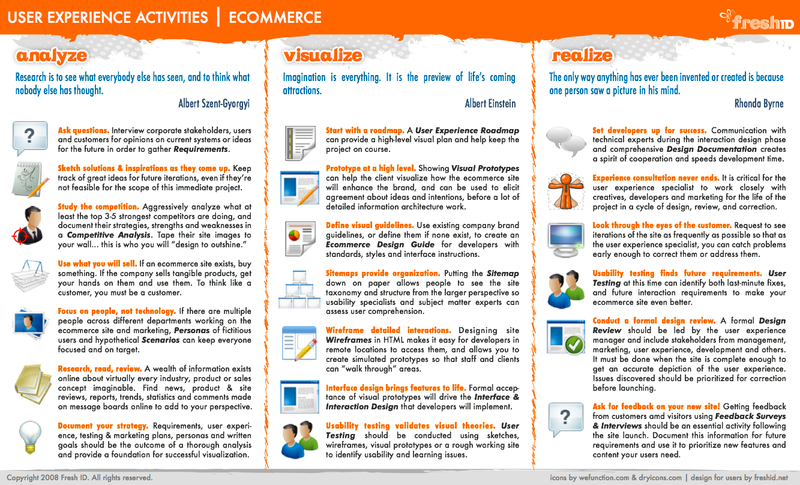 In an effort to better communicate what we do for clients, I’ve created two PDF documents that describe the various user experience activities that take place on an ecommerce or software design project. This was actually a bit harder than it looks – I began with the intention of creating a UE process, but the truth is, these activities can be done at various times throughout the life of a project, so they are somewhat chronological like a process, but not totally rigid. Many times, multiple things are going on at once. For example, I might be working on a Product Design Guide for developers, packaging design with marketing, and doing user testing on a particular feature, so it’s impossible to say “we must do this first.” Each company I work with is different and so the process has to be flexible to account for time, budget and necessity. You might also be interested in our User Experience Roadmap as a way to get started defining the user experience you want people to go through. Italic bold phrases in this document (ie. Personas) represent actual deliverables that will most likely be produced as a result of doing the activity, and are all things I have produced for various clients and employers. I will eventually offer a complete library of deliverable samples for people who are new to user experience, or companies who are curious about those documents. I hope you enjoy these!